Start A Bike Building 'How To' Business -- Market to motorcycle owners and motorcycle enthusiasts who are interested in building their own bike. Host a one day or weekend event where you show people how to build a kit bike or a ground up build. Sell kit bikes or custom builds to them, or sell a 'hand's on helper' program where they buy the kit or custom bike and they get to help you build it along the way. Use online using pay per click search engines like Adwords. And you can buy mailing lists that target any business or anyone who owns a particular bike and mail a few postcards and/or sales letters. Marketing is the key and it's fun. I just gave you a few tips that nobody else 'gets'. Send samples of your work and give a discount for first time customers. Even do a free job to gain a testimonial and reference for your marketing. Recommended Custom Motorcycle Airbrushing DVD's. Motorcycle Website -- Build a website around your favorite subject. Motorcycles. But focus on a specific type of motorcycle, not motorcycles in general. Your website will rank higher that way. After you get your pages ranked (hint: write good content on specific subjects), you can sell advertising space, or sell related items direct to customers. Another option is to sell other peoples products and make a commission. This is called affiliate marketing. Recommended Resource for making killer websites that attract traffic like magic: SBI. Sell Used Motorcycles -- If you have a little storage space and you can work on bikes you have the recipe for full time or part time profits. You can work from your home or work from a fixed location (check your state for specific licensing issues). All you have to do is buy bikes and turn around and sell them. It's fun and easy. You don't even have to work on bikes if you don't want to (just buy undervalued bikes and flip them). Places to check for bikes for sales are Craigslist.org, Ebay, and trade journals. If you can fix bikes you can really make a profit. There are tons of bikes with good bones our there and in many cases they just need a little TLC and then you can flip it. There is a huge opportunity in the motorcycle buying and selling marketplace because most dealers and bike owners are just terrible at marketing. Marketing is the key. You can even make a good income helping other people sell their motorcycles online. This is really fun because all you have to do is list bikes for sale, sell them, and collect a commission! No storage, and no out of pocket expense. Here's my Highly Recommended Resource for buying and selling motorcycles. 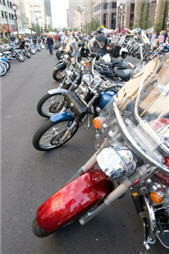 Sell New Motorcycles -- You can become a dealer if you have deep pockets or you can buy a motorcycle business. 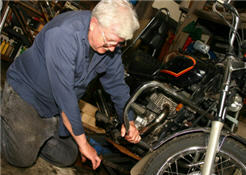 There are small repair businesses on up to small to large motorcycle dealers. The fast track to making money selling motorcycles would be to become a motorcycle sales person. Bike dealers need good, knowledgeable people to sell bikes, so get your resume together and talk these guys into letting you sell bikes. By the way ladies, you have an advantage here. Build Motorcycles -- If you can fabricate and you have all the necessary tools of the trade, you can build bikes and sell them. This requires time and money in the beginning. And it helps to win a few bike building contests. You may want to buy a bike kit and put it together and sell it first. Instant Cash Flow: Buy A Motorcycle Business -- There are many motorcycle businesses for sale. Buy an undervalued one or get the price down on one that is for sale. After you get the business improve it: improve customer service, and do some really good marketing. Most dealers and motorcycle business owners are terrible at marketing. They waste money on branding that doesn't work. Focus on direct response marketing and be systematized about it and you'll see the business double or triple overnight. It's easier than you think. The hard part is just keeping employees happy and motivated. The fun and easy part...and the most important is the marketing side. Recommended Resource For Marketing: Dan Kennedy's No BS Series. Teach Riding Skills -- If you can ride well you can teach others how to ride. This may require state approval so check into this (and if it does why not apply and get your riding skills business started). I know of people who are paying a guy hundreds of dollars to teach the racing skills and dirt riding skills. The teacher is just a good rider, not a famous person. He gets groups together to ride, and then he sells them on his riding skills classes. This is easy money. A hot niche is to teach women how to ride. Look, this is a really good niche because there are thousands of people out there who think learning to ride a big bike or even a dirt bike is hard and they don't know where to learn. Point the way and collect the cash. Boomers and Motorcycles -- Baby boomers are riding in the droves. Target boomers to help them find bikes that are right for them, teach them to ride, and host boomer events. The key to success is target marketing, and the baby boomer market is huge, growing, and they have money. But most of all they don't want to be known as old people who like to stay home and watch TV. Target them and have fun. You won't be sorry. Motorcycle Courier Service -- If you love motorcycles why not provide a courier service for motorcycle dealers. Couriers are needed to get parts to and from the shop when their gopher employee is flaking out or AWAL. You'll make some good contacts for future business partners and money on the way. Send these dealers and bike builders a cool postcard of you with your courier business shirt riding on your motorcycle delivering stuff, and a picture of your truck that is available as well. I am sure they would rather do business with a fellow bike lover. Are you good at marketing or are you good at computer graphic artistry? Market your services to motorcycle dealers and builders. They need good marketing and marketing ideas. Send them a letter and/or postcard describing your skills at helping motorcycle shops get more clients and make more money. Your phone just might ring off the hook. Motorcycle Show -- Host your own motorcycle show for either motorcycle dealers, bike builders, home built bike owners, or owners of bikes of a particular brand. Sell trade show booth space at your event. You will need some money, time, and a site. This is a short term project but if it works you might have a cash cow that returns every year. Custom Parts -- If you can fabricate parts, market your skills to bike builders and dealers. They may need something special for a project and why not use you? 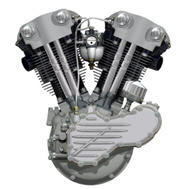 Motorcycle Repair -- Can you repair bikes or repair a specific brand of motorcycle? If so you can make a few bucks. Take it to the next level and get certified by MMI or similar institutions, or specialize. For example, vintage bikes. If you can specialize in vintage bikes or a particular vintage brand you will have these enthusiasts busting down your door. One way to find vintage bike owners is to do a search for forums and websites on particular bikes you are interested in. Or specialize in a type of motorcycle: dirt bikes, side car motorcycles, trikes etc. etc. The more specialized you become the more you can charge (you can make money selling parts too, and guides as well). Motorcycle Insurance -- If you want to get more on the professional business side of things you can get your license and specialize in selling motorcycle insurance. Motorcycle Travel Agent -- Put together motorcycle trip packages and sell them as a specialized motorcycle travel agent. So what you do is become a travel agent (it's not hard), and create motorcycle travel packages ranging from domestic to overseas packages. You take care of all the details and sell the package for a nice commission. This can be really fun. You can probably even use this as an excuse to travel and right off the expenses (as your CPA). Motorcycle Travel Guide -- Market to motorcycle enthusiasts overseas or in other states that want to tour the area you live in. Or if you know an area well just market your services online and through travel agents. Put a motorcycle tour together (easy as pie and fun) and then invite people to come for a price. Include rest areas with food and entertainment. Sky's the limit. Have fun with it. Motorcycle Journal -- Document all your travels on a Blog and if you get a lot of traffic from your posts you can leverage that traffic into money. See the motorcycle website tip above because they are both very related. Link your blog to your Solo Build It site. I hope you find this article helpful. Let us know if you have any motorcycle business ideas or motorcycle business opportunities. Have A Motorcycle Business Idea or Have A Question? Do you have an opinion or story about this motorcycle business ideas article? Share it! Check State Or Province Laws! How do you deal with the liability issues of building and selling a custom bike? Motorcycle or Chopper Business Cards and Ideas That You May Not Have Considered. Custom Motorcycle or Chopper Business Guide.